For breast feeding baby, right time for introducing solid foods is only after six months. Some mothers weaning earlier just after four months, but it is advisable to wean your baby only after six months. The major reason is that before six months your baby’s digestive system and kidneys are under developing stage and are not yet capable to digest solid food. Weaning earlier can affect your baby’s digestive system and also cause a high risk of developing food allergies later on. You should introduce solid food to your baby gradually. You should also continue breast feeding your baby with solid food. You can continue breast feeding your baby with solid foods for one year to protect your baby from various illness and infections. Introducing solid foods to baby can make your baby familiar with different type of tastes. Keep some patience to introduce solid food to your baby. When you find some sign like your baby don’t get satisfied with breast feeding or bottle feeding, your baby can be able to support her head, you find increasing weight of your child then you need to understand that it is right time for weaning your baby. Introducing solid food to baby is indeed a big task as some babies refuse to eat anything other than mother’s milk. In such case it is very difficult for mother to wean her baby. You do not need to stop breast feeding suddenly. You need to proceed gradually and wisely without hurt your baby. As your baby is attached with you more emotionally until you breast feed her, if you suddenly stop feeding your baby, she gets bad feeling in her mind and she cries when she becomes hungry. You need to give her some time that she tries to accept foods other than mother’s milk. You can skip a feeding initially. When you found your baby really hungry, give her bottle feeding. If your baby refused bottle feeding, you can pump your milk and give it to your baby in bottle. In such case, she found similar taste and might accept bottle feeding. In this way you can introduce formula feed or cow’s milk gradually. You need to check age limits when you start formula feed to your baby. You can find on formula packing. Read all instructions properly before start any formula feed to your baby. You also need to take some advice from your baby’s doctor when you try to introduce solid foods to your baby. You can increase skipping feeding your baby more times once your baby accepting bottle feeding or formula feeding. You should keep an interval of one week to reduce breast feeding. For example, initially you give bottle feed to your baby during daytime in the afternoon then you can start it in the evening in second week. Gradually you can give her during morning hours in third week. You should continue breast feeding baby at least once in a day for one year if it is possible for you. It is not essential to skip a week for changing your baby’s habit. You can adjust it as comfortable to your baby because it depends on how fast your baby can accept other food. You also need to reduce breast feeding time to your baby. If she takes 7 minutes for feeding, you need to reduce it for 4 minutes slowly. Normally, all babies can accept bottle feeding during daytime, but in the night they prefer mother’s milk. It is very difficult for such babies to change their habit and it takes a long time to wean such baby. Therefore, it is again advisable not to stop breast feeding immediately. You need great patience to change habit of your baby. At the age from six months to twelve months, until your baby does not get all teeth in her mouth, she finds problem to eat any hard food. Therefore, you need to smash food and prepare smooth puree that your baby can easily swallow. You should give your baby a variety of protein, carbohydrate food, Iron-fortified cereal, fruits, and vegetables. You can give different vegetable soup, unsweetened fruit juices, baby rice and milk [Cow’s milk is the best for child] for your baby. You can start with rice cereal. Prepare it as directed on container. When you try different food for your baby, you should keep watch on her diet schedule that she can easily digest food. If she found any constipation or gastric problem, you should reduce quantity and number of servings per day. You should contact doctor if your baby finds major constipation problem. You can introduce different food after some interval. It is very essential because you can identify if you drop some days or a week to introduce new food such as your baby like taste of food, she can digest it properly, she doesn’t find any food allergy, etc. You can introduce another taste like vegetables soup or fruit juices with sweet taste. Your baby will take time to eat; sometimes she keeps food in mouth and not swallows it. Therefore, you need to attend her fully until she finished her food. You can use colorful baby bowl and spoon while serving. Your baby gets eager if she finds colorful things. Make fun with your baby while you introduce new food to her. If she refuses to eat, divert her attention in different thing and try to make her eat again. Taste your baby’s food first, then give it to her, check that it is tasteful enough for your baby and warm properly. Do not serve your baby very hot or very cold food. Use different shapes plates, spoons, water glasses with colorful carton pictures to attract your child’s attention. In such way, you can tempt your child to eat food. Infant’s digestive system is still under developing stage. You should understand your baby’s eating habit and plan diet according to her age, physical activities and digestive capacity. More salt and sugar in your baby’s food. For six to eight months baby you can give solid foods 2 to 3 times a day while for nine to two years old baby you can give 3 to 4 times a day. Introducing solid foods to baby is sometimes very difficult for many mothers when their babies rejects mostly all types of foods and prefers only milk, formula feed or mother’s milk. In such case, the only advice is give food to your baby when she really gets hungry. If she resists continuously, then try different food. Of course it is very difficult for you but you can make her physical active and try to increase her digestive capability. 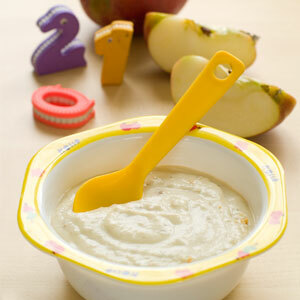 In such way, you will gradually weaning your baby completely onto solids.